Check out our All-New Waste Calculator to find out how MachineMetrics can help identify and reduce wastes in your manufacturing process! In any business, the greatest enemy of profitability is waste-- typically of time or money. In lean manufacturing, waste is any expense or effort that is put forward which does not transform raw materials into an item the customer is willing to pay for. There are 8 types of waste in Lean Manufacturing. Seven of the eight wastes are production process oriented, while the eighth waste is directly related to management’s ability to utilize personnel. One of the most easily recognizable wastes in lean manufacturing is the production of Defects. Examples of Defects in manufacturing include waste such as scrap parts, products that require rework, or assemblies that are missing details. Defects are often considered to be one of the most significant manufacturing wastes because they can actually lead to the generation of additional wastes such as Overproduction, Transportation, and Excess Processing. When products do not conform to a customer’s requirements, the products must be repaired or remanufactured to satisfy the customer’s needs. If the customer’s requirements are not clear, more work may be performed during the creation of the product than is actually required, (such as fine polishing surfaces so they look shiny), even though the customer did not request it. Repairing, remanufacturing, and over processing are examples of lean manufacturing waste referred to as Excess Processing. Of all the 8 wastes in manufacturing, Overproduction has, by far, the most negative impact on success. Overproduction occurs any time more parts or products are produced than the customer is willing to purchase. 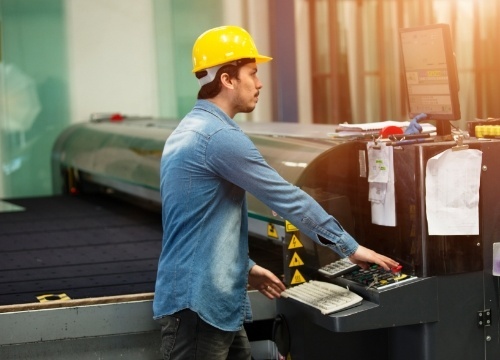 Like the production of Defects and subsequent Excess Processing, Overproduction can also lead to the generation of additional lean manufacturing wastes such as Waiting, Inventory, and Motion, consuming vast amounts of time and resources. Waiting is a reference to inaction that adds cost to a product being produced for a customer. This occurs because overhead costs continue to increase during the time the product waits to be transformed. When product waits, no value is being produced but the cost of overhead operations continues to grow, which strips potential profit from the sale. Waiting not only destroys material and information flow, but also generates excess Inventory. Inventory is a manufacturing waste because it is value that is being held at a cost. In the most literal sense, Inventory is valuable product or material that is waiting either to be sold to the customer or further transformed into something of greater value. The entire time a product sits in Inventory, its profit margin is reduced because overhead must be paid to maintain the product in Inventory. Maintaining Inventory requires the addition of Motion and Transportation wastes. Moving product costs money, which is why Transportation is classified as a manufacturing waste category. Unless value-added transformation is performed to the product or material during transport, the Transportation of a product or material is wasteful activity. Great amounts of resources and time are consumed moving material while no value is being added to sell to the customer. Transportation leads to increased Motion lean waste because resources are required to move without generating value. When Motion occurs, value is not added to a product or material being manufactured. Motion can be either people or machine, but is most often a human resource whose effort and time are being wasted. Inefficient shop floor layouts, and improper equipment can contribute to unnecessary motion. The employee’s efforts are not only being wasted, but Motion can also result in physical injury to employees which results in even greater cost to the business. Motion waste is closely related to wasted employee potential, commonly referred to as Non-Utilized Talent. The only lean manufacturing waste that is not manufacturing-process specific, but rather manufacturing management related, is Non-Utilized Talent. This type of manufacturing waste occurs when management in a manufacturing environment fails to ensure that all of their potential employee talent is being utilized. In relationship to Motion waste, if an employee is aimlessly moving material around the production area without adding value their efforts are being wasted where they could be performing value-added activities instead. Non-Utilized Talent also refers to management’s ability to utilize the critical thinking and continuous improvement feedback from employees to improve a lean manufacturing process. If management does not engage with manufacturing employees on topics of continuous improvement and allow employees to influence change for the better, it is considered manufacturing waste. Eliminating the 8 wastes of lean manufacturing is much easier when the production process is completely visible. MachineMetrics offers that transparency, allowing employees to engage with the actionable data in real-time. Manufacturers must understand what the customer is willing to pay for, then apply Lean Manufacturing to systematically eliminate the 8 wastes within production processes in order to maximize profitability. Use our All-New Waste Calculator now and find out how MachineMetrics can help identify and reduce waste. What are you waiting for? Contact us now and learn more!